Radiation levels at the Hanford, Washington nuclear waste site have spiked to “elevated risk” after thousands of gallons of toxic waste leaked in April. The site occasionally “burps” radiation, which now reached levels requiring evacuation, RT has learned. The recent readings from the Environmental Protection Agency (EPA) obtained by RT have revealed that a sharp spike in the radiation level had been registered in Richland on the morning of May 5. The readings show the random jump when the toxic fume rates briefly reached around 410 CPM [counts per minute], nearly the highest possible level. It equals to around 4 microsieverts (uSv) per hour, a common measurement of radioactivity. To put this into perspective, the single lifetime human dose should be between 0.71 uSv/hour and a maximum of 5.7 uSv/hour, according to Radiation Survival. Long-term exposure to radiation is required to really cause serious harm, as it happened in the infamous cases of Chernobyl or Fukushima. As of Friday afternoon, there have been no media reports suggesting that an evacuation or other measures and guidance have been ordered for Richland. RT's Alexey Yaroshevsky has spoken to area residents, who told him that the Hanford Nuclear Reservation “burps radiation" and that this registered spike might have been one of them. It is unclear though, how often these “burps” strike, or for how long they have been happening already. The most recent radiation spike comes less than a month after a massive leak was first detected at the nuclear facility’s AY-102 double-shell tank, on April 17. The Washington state Department of Ecology said then that there was “no indication of waste leaking into the environment or risk to the public at this time.” It added that the leak was an “anticipated” outcome of an ongoing effort to empty the tank. 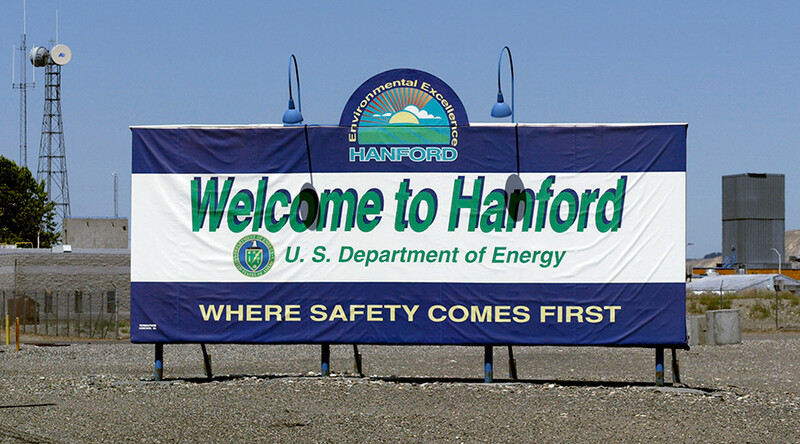 In general, the department considers Hanford “safe”, saying that the waste there is contained. “It isn’t accessible to the public, and employees who perform cleanup work receive specialized training and wear protective gear,” the DoE said. The tank originally held some 800,000 gallons of waste, and has been known to experience minor leakage since 2011. At the time, this fact did not merit much attention from the local authorities. The government contractor managing the tanks, Washington River Protection Solutions, did not acknowledge the problem until 2012. Hanford is located on the Columbia River in eastern Washington, near the border with Oregon. Built during World War Two as part of the Manhattan Project to develop the nuclear bomb, it still contains roughly 53 million gallons – over 2,600 rail cars – worth of high-level nuclear waste, left from the production of plutonium for the US nuclear weapons program. Since 1989, the only work at the Hanford Site has been related to cleaning up the waste left behind. Last year, Hanford started moving radioactive waste from single-shelled tanks into double-shelled ones, which are supposedly safer. However, this turned out to be not as safe for the workers. According to officials at Hanford, 42 workers were evaluated for vapor exposure after the leakage. In total, 31 people have reported symptoms, while 11 requested evaluations as a precaution. They have all been cleared to return to work, despite obvious health risks. Despite the magnitude of the problem, the incident has largely gone unreported in the national media, leaving it up to local news outlets.